2 Nov Post by Salon Buzz Filed under Uncategorized. Tagged Bumble and bumble, chicago fashion show, chicago hair, fashion show hair, rush woman's board, rush woman's board fashion show. On October 13th, 2016 Salon Buzz had the pleasure of providing hair styling services for the Woman’s Board of Rush University Medical Center’s 90th Annual Fashion Show. The show, now in its 90th year, is the longest running charitable fashion show in the country. This year the Woman’s Board has committed to raise $500,000 to support The Road Home Program, which connects veterans and their families with the specialized mental health care, peer-to-peer outreach, counseling, and resources they need to transition from military to civilian life. New York based designer, Adam Lippes, came to show his support for the high profile charity show and hand selected ten resort looks for the show. Models at the show donned an assortment of high-end designer ensembles and sported a variety of hairstyles including French twists, soft curls with side parts, low ponytails with middle parts and low chignons. To craft these unique looks, Salon Buzz hair stylists used products from Bumble and bumble. 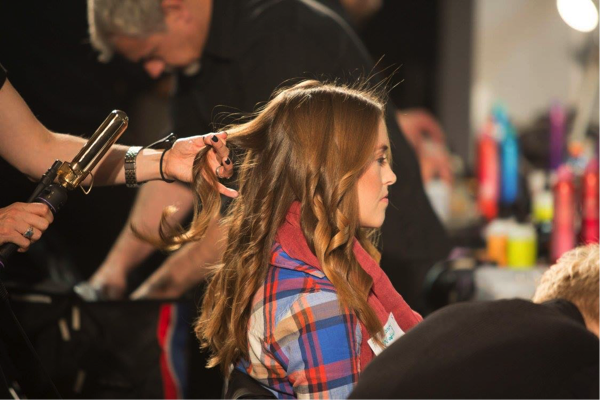 Watch backstage footage of our stylists in action in this video, courtesy of the Woman’s Board!